Moving the family from the UK to France was intended to bring a new and better life, and to give two newly adopted and troubled children a fresh start. One Monday morning, everything changed; the whole family would fall apart in the instant it took for one little girl to lie. “In a country where it is presumed ‘children don’t lie,’ it took three years to fight the archaic, biased French system and clear my name by law, but clearing my name with the French people was another matter.” In this true story, the author tells how sometimes “good intentions” are not always enough. 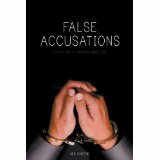 He wrote this book to show how False Accusations affect not only the accuser and the accused, but everyone in between. About the Author: Nik Greene grew up on a farm in Norfolk, England. He moved his family to Limoges, France in 2004, and today lives between Pompadour, France, and Kent, England. He is now studying criminal psychology, and is working on a series of books about a private detective named Jack Thompson.